Thank you to Carolina Renaissance Festival for providing me with tickets in exchange for my review. All thoughts shared are my own. Every October and November, there's an event that our family looks forward to almost as much as Halloween and Thanksgiving. 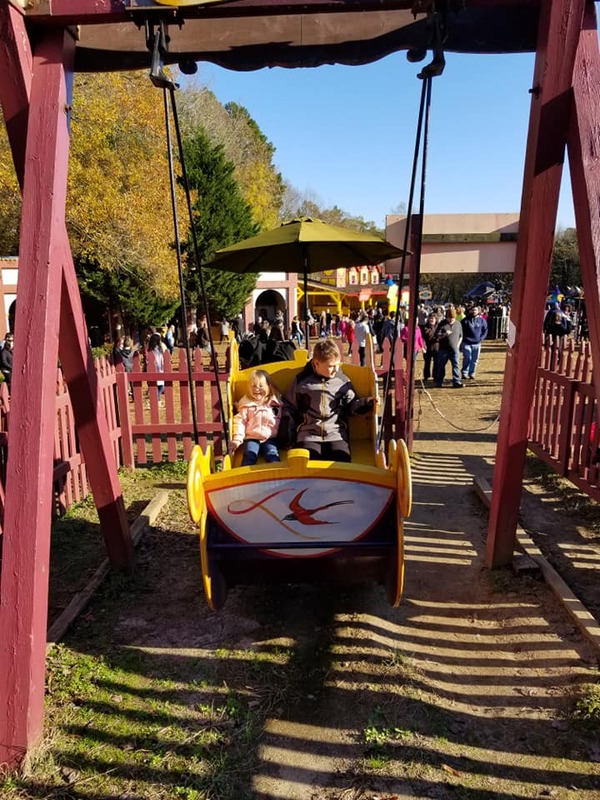 The Carolina Renaissance Festival comes but once a year, running October through mid-November, and for the past six years, an annual trip to the festival has been a family tradition. 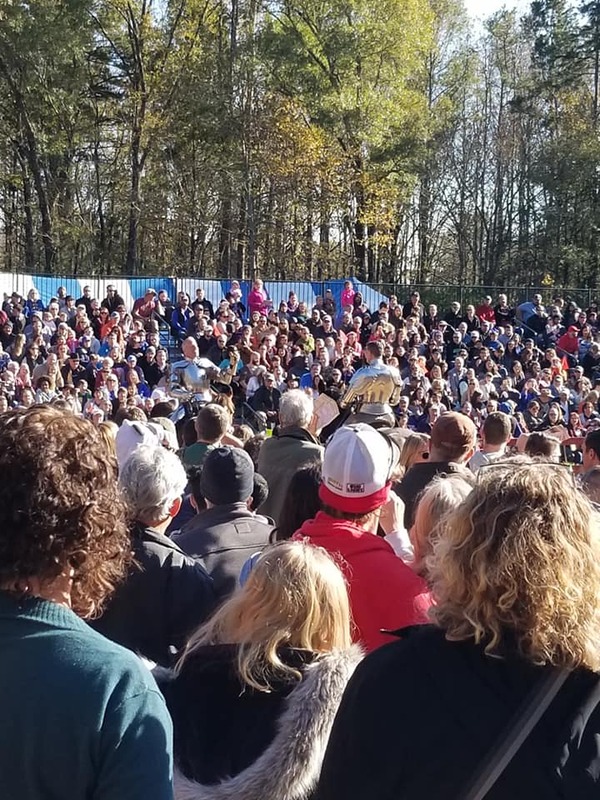 Taking place in Huntersville, NC, the festival brings together the fun and excitement of the Renaissance era, incorporating everything from food, games, live shows, music, artisan shops, and of course- jousting! The Carolina Renaissance Festival is celebrating 25 years of fun! Throughout the festival season, there are themed weekends, costume contests, and so much more! 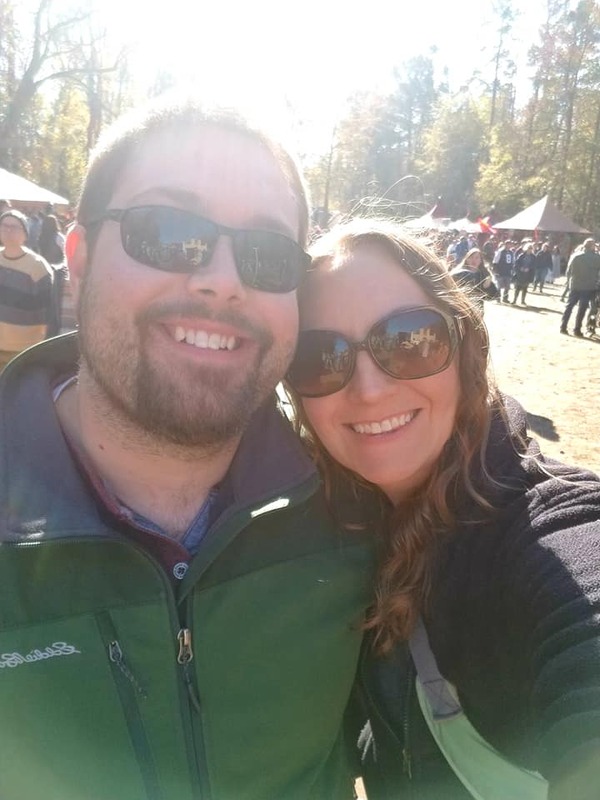 We chose to visit the festival this past weekend. It was the first nice, sunny weekend that we've had here in this part of NC in the past three weeks. It was crisp and chilly, but the sun was nice and warm, as were the smiles of all of the festival goers and participants. Rides and Fun for all ages! The Swan Glider is a 'free' ride at the festival, and accepts tips. There are so many fun rides at the festival! The Swan Glider is a free ride for children only. It's a large gliding swing, and kids can ride two at a time or four at a time. 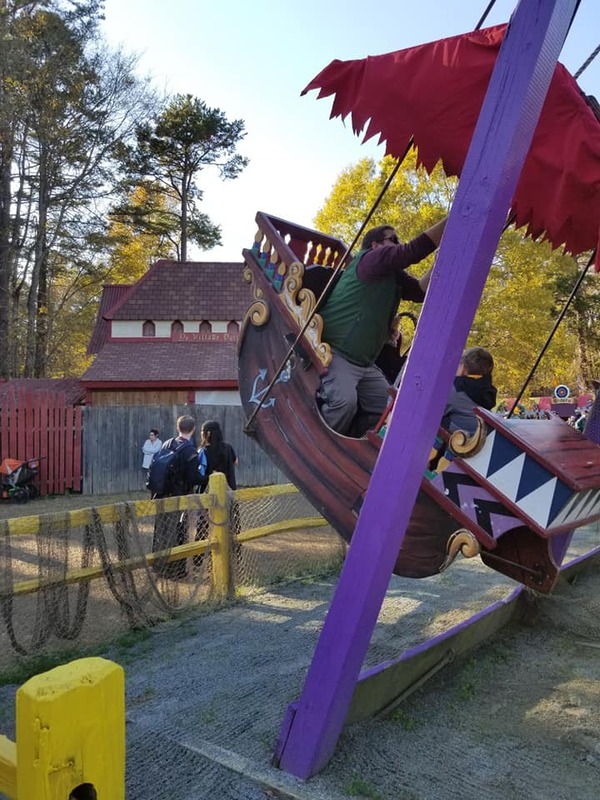 This ride is often crowded, so if you're visiting with kids and see that there isn't a long wait for this ride, I would recommend going ahead and riding it before the long lines form for it. Our kiddos rode this ride twice, and we tipped the ride operator. The Flying Pirate Ship Swing was the ride that B was most excited for. We waited until the end of our time at the festival to ride this one. The pirate ride operators give the ship a big push, and then you're on your own to use your strength to pull the rope, which makes the ship swing way up high! Both of the kids loved this ride! 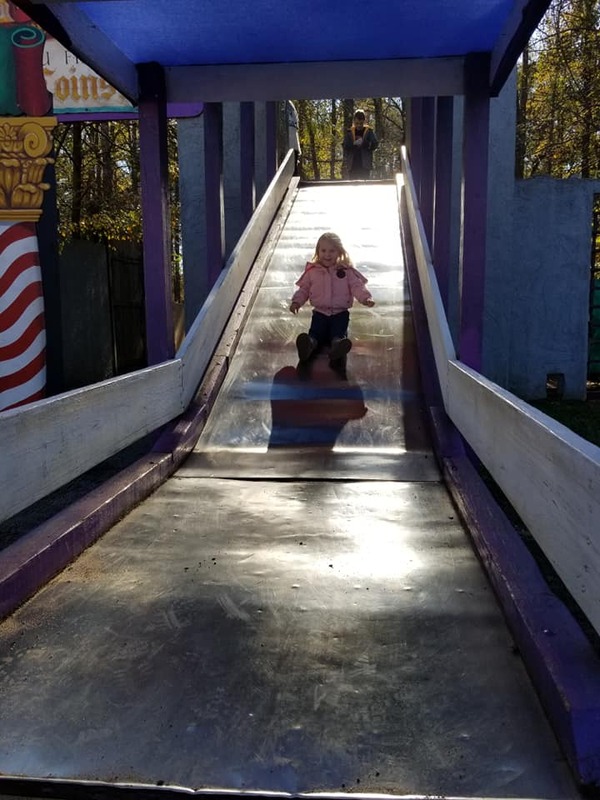 The maze and giant slide are always amazingly fun! Another favorite ride/attraction for my kids is the coin maze and big slide. It's $2.00 per child to go through the maze. As they go through the maze, they collect gold coins. Once through the maze, they can make their way up the staircase and come down the giant slide. There are tons of rides throughout the festival, including live camel rides, kids 'jousting', a carousel, and more! There's also a new playground for the kiddos to play on, which is free. All of the rides are pay per rider, per ride. Cash only! The swords and shields shop is one of B's favorites! 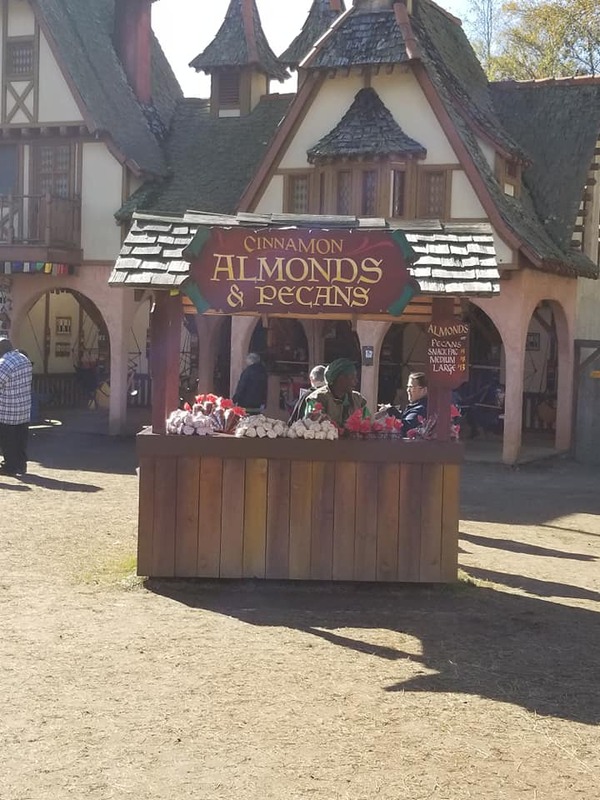 One of my favorite things about Ren Fest is the shops! I love to walk through the artisan shops, and just look at all of the beautiful craftsmanship. All of the items in the shops are handmade, just as they would have been back during the Renaissance. 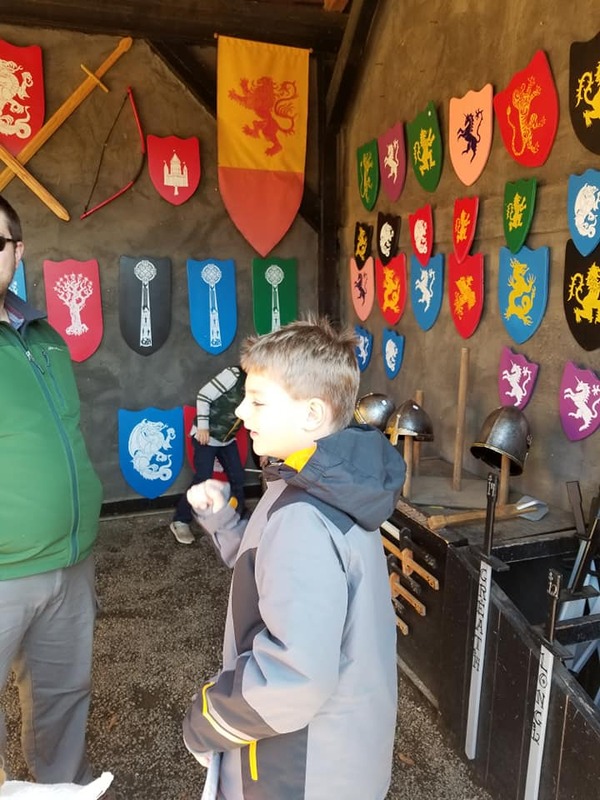 B needed a new shield for his portrayal of King Richard I (Richard the Lionheart), and we found exactly the right shield for his costume at Carolina Ren Fest! What luck! The medium size shield (wooden) was just $20.00. We have a collection of wooden swords and shields from previous Ren Fest visits! The Fairy Secrets Natural Skin Care shop is also a favorite. Some of the fair maidens of the festival are out among the crowd, giving out samples. There are two of these shops throughout the marketplace. Along with skincare and swords, there are gorgeous crowns, toys, leather goods, jewelry, and so much more! You almost have to go through the marketplace twice to make sure you don't miss a thing! NEW! Live mermaids- free to festival goers. There are tons of shows at the Carolina Ren Fest. Not all shows are suitable for kids, though- like the (hilarious and raunchy) Tortuga Twins. So be sure to check the festival map and flyer for info on the ratings of the shows. Small stages host musicians, comedians, and more! B was mesmerized by the aerialist putting on a live show near the dining area. 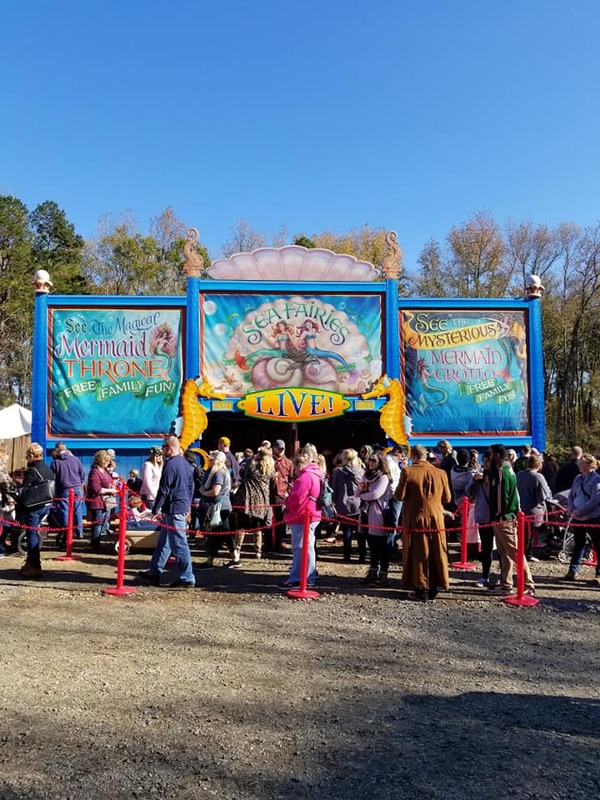 There's a brand new live mermaid show this year, which we didn't get to see because the line to get into the show was way too long. It's definitely worth checking out, though! Bean loved listening to the sweet voice of this pretty lady! The joust- the show to end all shows! If you only get to see one show at the Carolina Ren Fest, don't miss the joust! The knights come out on horses, and really joust! There are 3-4 shows set up throughout the festival day, so mark down the times and plan your activities and dining around the jousts, so you don't miss a thing! I love the candied almonds! 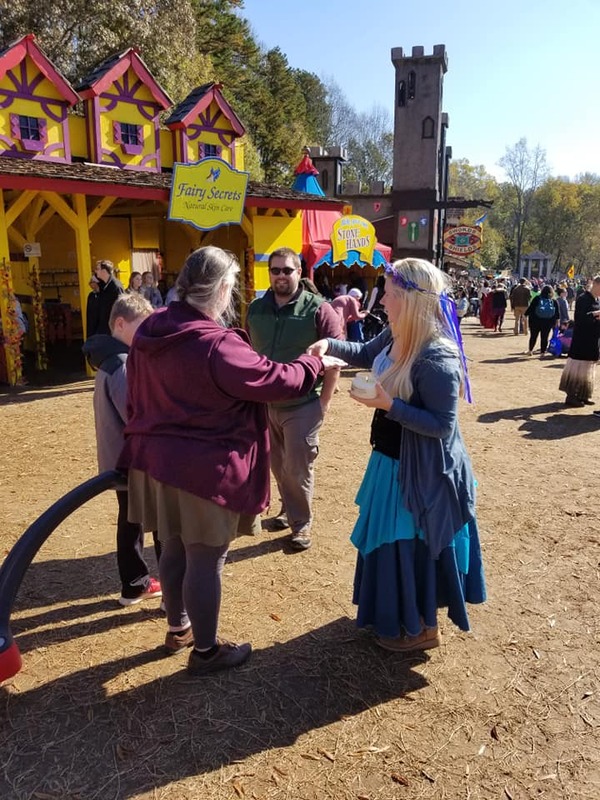 Another reason to go to Ren Fest is for the food! There are tons of food options from chicken and chips to pizza, turkey legs, jumbo pickles, and soup and chili in bread bowls. You can also get your drink on, enjoying lots of cold beer and mimosas! Bring lots of cash- most all of the food shops and stalls are cash only. A basket of two chicken tenders with fries runs $7.00. Drinks can be purchased for an additional fee. Don't forget to visit the chocolate shop! We always stop in at the chocolate and fudge shop. 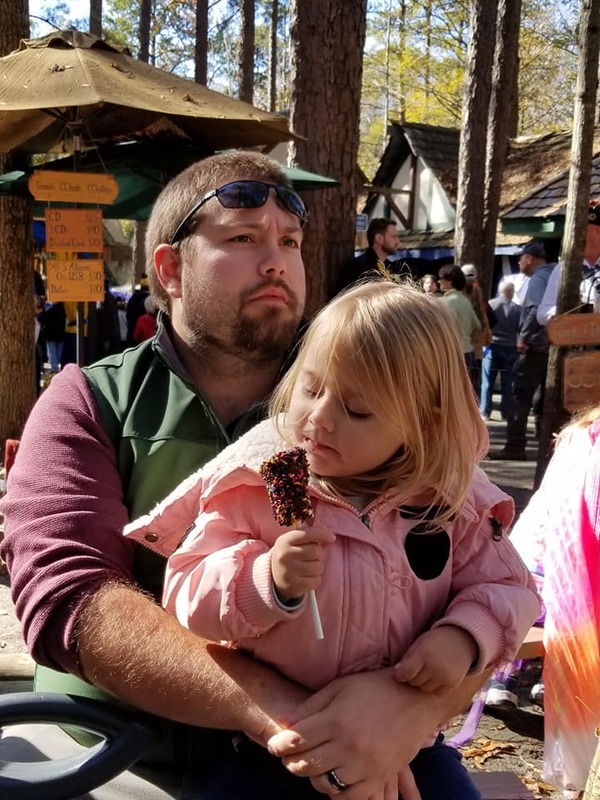 The kids love the chocolate covered marshmallows on a stick, covered in sprinkles. This tiny treat is $2.00/per marshmallow stick. 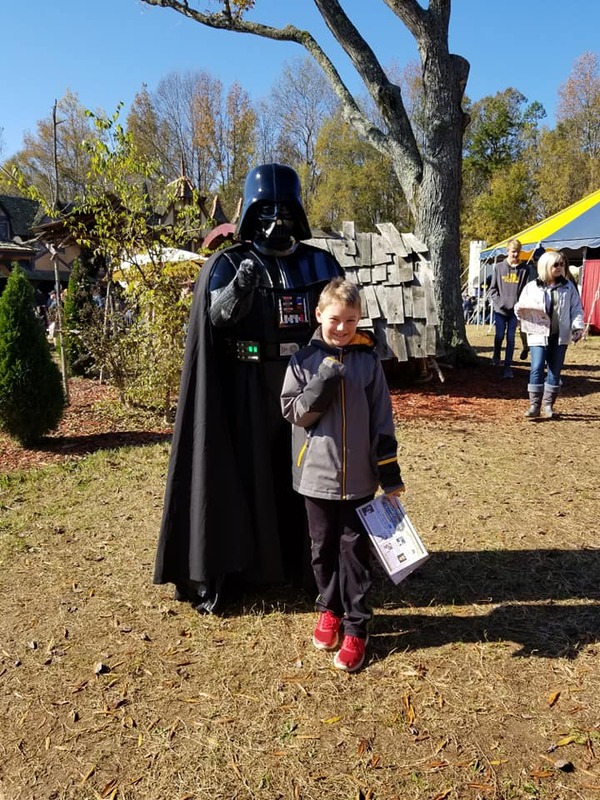 What the heck is Darth Vader doing at Ren Fest!? Remember the theme weekends I mentioned? We attended Ren Fest on Time Travelers' Weekend, so there were lots of cool costumes! We saw a pretty convincing Darth Vader and both Storm and Death Troopers. There was even a costume contest going on, with a cash prize of $1,000.00! If you want to dress up for the festival, it's totally cool and acceptable to do so. Costumes are available for rent or for purchase throughout the festival. A great place to have a good time! 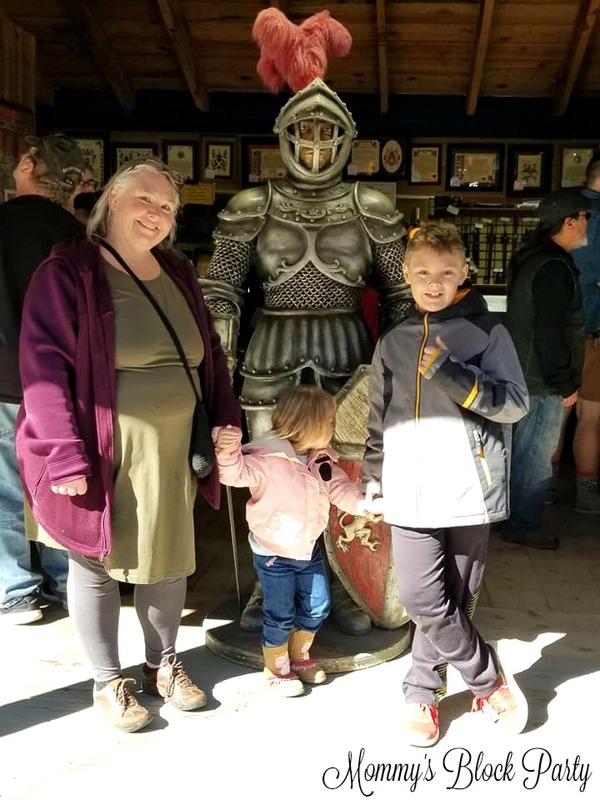 I always say that I want to have an adults only visit to Ren Fest, so we can enjoy beer and food without having our hands full with our kiddos, but it's so much fun for the kids to experience Ren Fest! There are tons of things for them to see and do- it's a great time for the whole family! 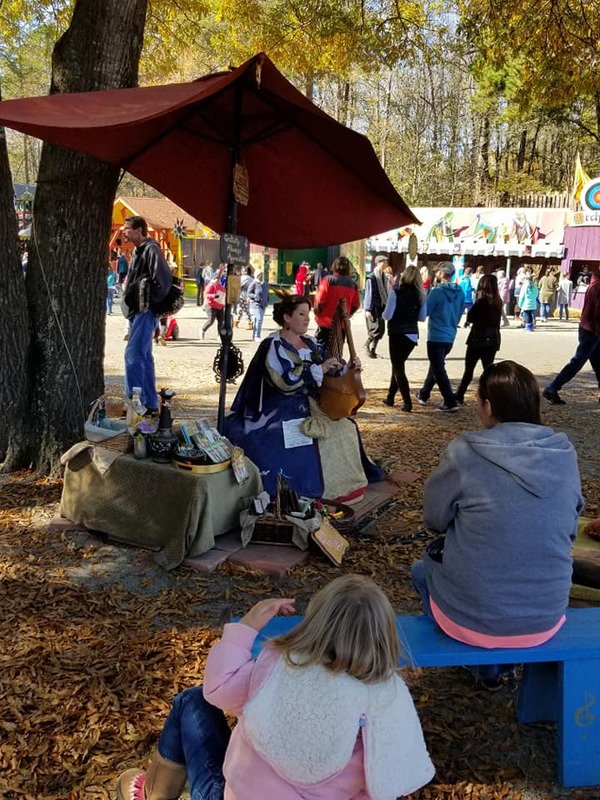 If you've never been to the Carolina Ren Fest, you should definitely experience it at least once! Next weekend is the last festival weekend of the 2018 season, so there's still time for you to get there! Kids 5 & under are free and don't need a ticket. Parking is also free (plan to wear comfy shoes! ), unless you want a prime spot, closer to the festival gate. You can purchase a VIP parking pass if you want to park close to the entrance. *Tip: Plan to get there early and to leave early. Do not stay until the festival closes for the day unless you want to sit in traffic for over an hour trying to exit the festival. Been there, done that many times over. We left at 3:30 pm, and it took us 30 minutes to exit the festival grounds. *Tip: Bring cash and lots of it. You're going to need it for food, drinks, and rides. Some shops, but not all, take a credit card. There is an ATM on the back end of the festival if you want to go that route. For tickets, festival info and news, head to Carolina Renaissance Festival. 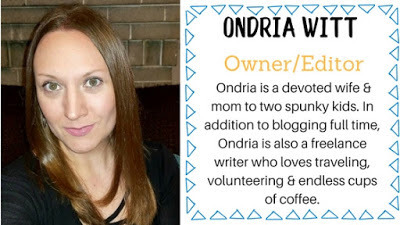 Connect with Carolina Rent Fest on Facebook. Have you ever been to the Renaissance Festival?